If your Excel Online workbook has only one worksheet, you can just print the worksheet. But if the workbook has multiple worksheets you’ll need to go to each worksheet by clicking its sheet tab, and then print that worksheet. If the Unhide option is available, the workbook has one or more hidden worksheets. Click Unhide to show and unhide the worksheets. 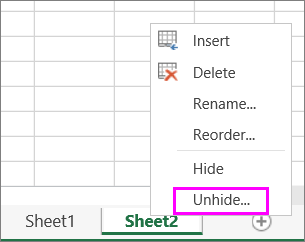 When you unhide a worksheet, its sheet tab becomes available. Click the sheet tab and print the worksheet.